The Hamas government in Gaza has ordered international and local aid organisations providing emergency assistance to coordinate relief efforts with it. Several local NGOs in Gaza say Hamas has prevented aid groups from distributing emergency assistance after they refused to comply with Hamas regulations. “We received information that supplies brought in from abroad were being sold on the market,” deputy minister of social affairs Sobhi Redwan told IRIN, saying UNRWA (the UN agency for Palestinian refugees) was bringing in supplies for non-UN institutions and donors. International aid agencies like Oxfam and CARE say the “logistics cluster” coordinated by the World Food Programme (WFP) is the only mechanism under which trucks are sent into Gaza. “We do help other UN agencies and other organisations deliver,” UNRWA spokesperson Chris Gunness told IRIN by phone from Jerusalem. “We have asked UNRWA to supply paperwork for all trucks indicating the contents and who the truck is for,” said Hamas deputy minister Redwan. UNRWA has half-complied, say Hamas officials. “As a matter of practicality we need to coordinate with authorities at all levels to make the deliveries possible,” said spokesperson Gunness. 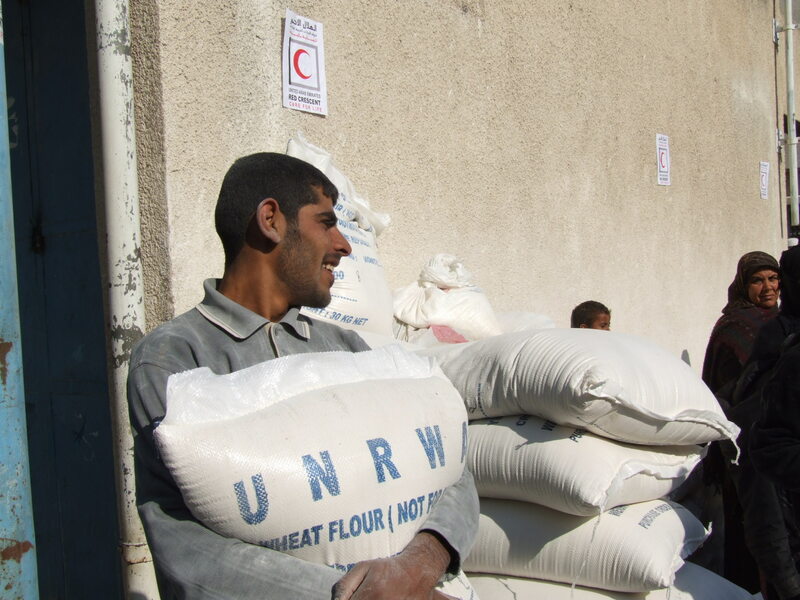 UNRWA - the largest distributor of aid in Gaza - said it needed over US$5 million for food aid as part of its appeal. Gaza’s social affairs ministry has asked all international and local NGOs to provide a list of beneficiaries on a CD to the ministry. “We want to make sure that aid is being distributed equitably,” said Redwan. International organisations like Oxfam and CARE have not complied. “We have explained to Hamas that we will not disclose our beneficiaries out of accountability to our donors and our values of impartiality,” Oxfam public relations officer Michael Bailey told IRIN by phone during a visit to Gaza this week. Oxfam and its local partners “are operating as they need to”, said Bailey. A local NGO in Beit Lahiya that agreed to speak to IRIN on condition of anonymity had planned to provide emergency assistance in rebuilding and repairing homes after the war. Funded by the Swiss government, the NGO engages in advocacy work for women’s and children’s rights and sustainable development projects like raising domestic animals. It’s a political issue; Hamas NGOs are giving to Hamas and Fatah NGOs to Fatah. A local NGO in Jabalyia that specialises in social governance and civic engagement projects with an operating budget of US$200,000, mostly funded by USAID (the US Agency for International Development), also agreed to speak to IRIN on condition of anonymity. The NGO had an emergency relief operation from 29 December to 25 January distributing food kits and blankets to 8,000 beneficiaries in Jabalyia, and had planned to offer psycho-social support services. But “Hamas police came to the NGO and ordered us to stop working, without explanation,” said the director. He feels he was targeted as a Fatah member. The Hamas authorities requested a list of beneficiaries, but if the NGO coordinated with the Hamas government, USAID would halt its funding, said the director. “It’s a political issue; Hamas NGOs are giving to Hamas and Fatah NGOs to Fatah,” said Ibby al-Oul, board of directors member of a small local NGO, Asalah, which runs small business development projects. Asalah intends to provide adoption services for children orphaned during the war, but will not disclose information to the Hamas government, said al-Oul.